Preparing for an exhibition to accompany a one-woman show about Vesta Tilley, featuring Claire Worboys so blog time is limited. This is mainly pictorial which makes it easier for me and, with a bit of luck, interesting for you. A new addition to the collection is Mignon Tremaine, a singer and dancer with a name I couldn’t resist. 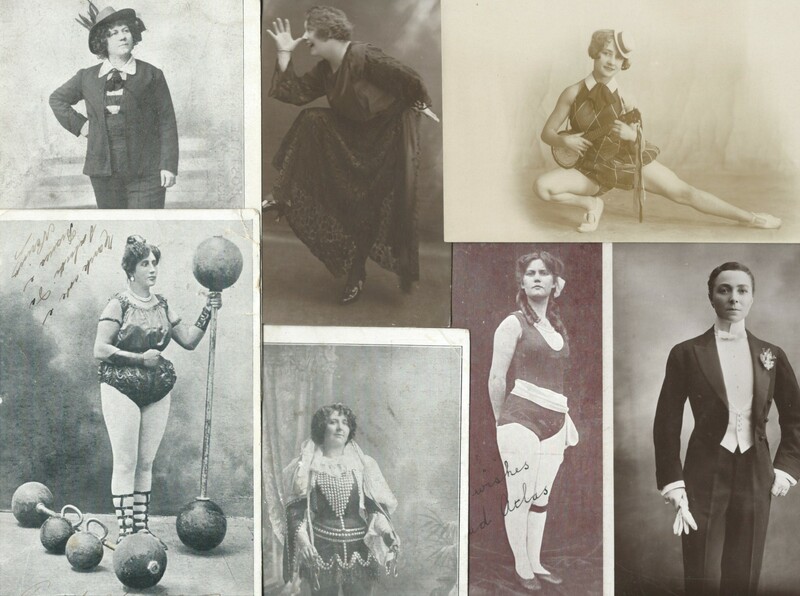 Vesta Tilley impersonated men who were very recognisable to the music hall audience. 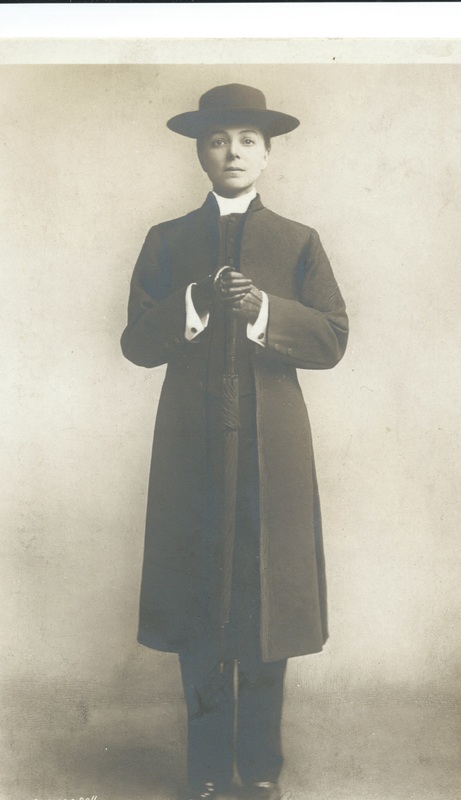 Her costumes were made by tailors in Bond Street, London and were meticulous in their detail. Here, she is a curate and makes it work through facial expressions and mannerisms as well as costume. 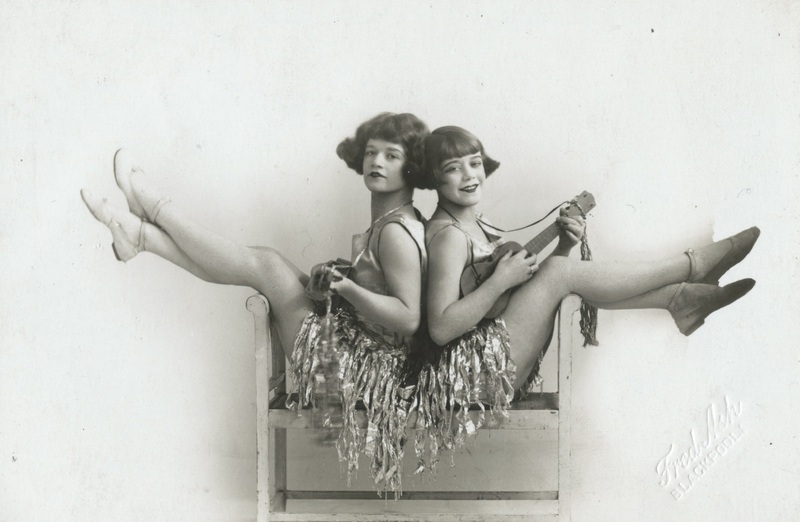 Ukuleles are popular again and we can nod sagely and point out there is nothing new under the sun. This is probably a later card as the young women have short hair, possibly wigs, and strappy tops. 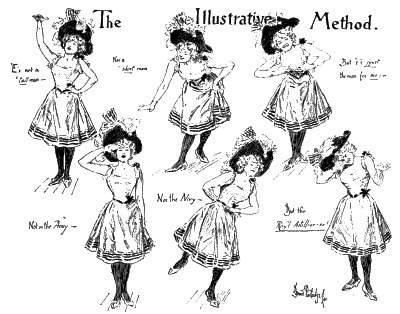 Eccentric dances to accompany songs were popular in earlier music hall and, although I subscribe to this form of dancing, it’s not generally found on theatre stages these days. 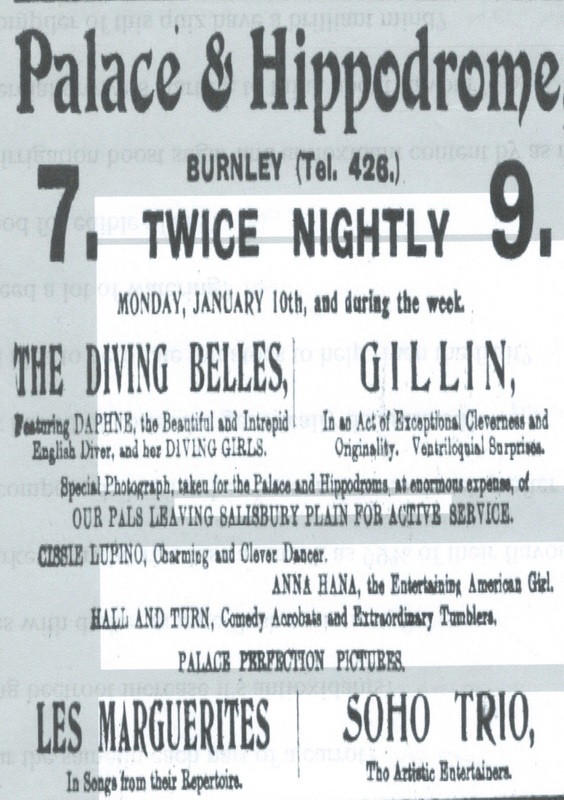 Lastly, an advert for the Diving Belles, mentioned in a previous post. Daphne obviously caught the publics’ interest as she is often mentioned in reverential tones. As leader of the troupe she has the privilege of sitting down. You can click on the advert and dance picture to get a larger image. This entry was posted in Uncategorized and tagged male impersonator, Mignon Tremaine, Vesta Tilley as curate on September 16, 2015 by Monomania. 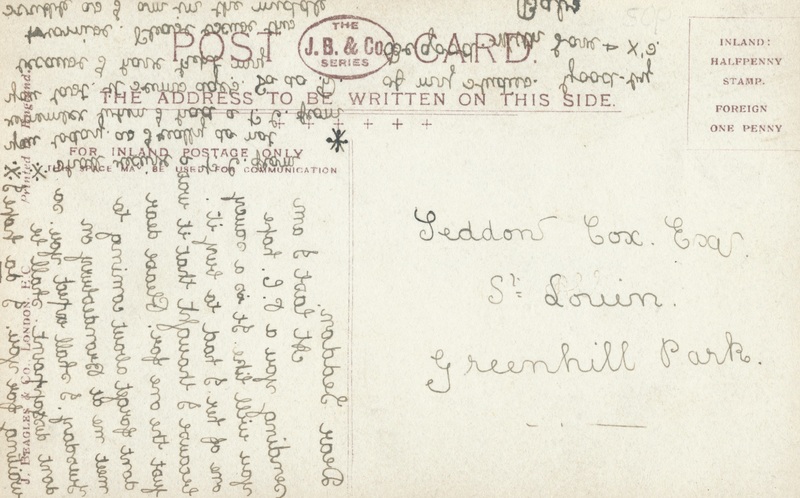 Sometimes the comments on the back of the postcards can be quite intriguing. On turning over a photo of Vesta Tilley we find a message from Ernest to Miss Eva Cooper in Dublin, sent from Glasgow in 1906. It says ‘we broke all previous records here yesterday. Had two of the biggest houses we ever had. 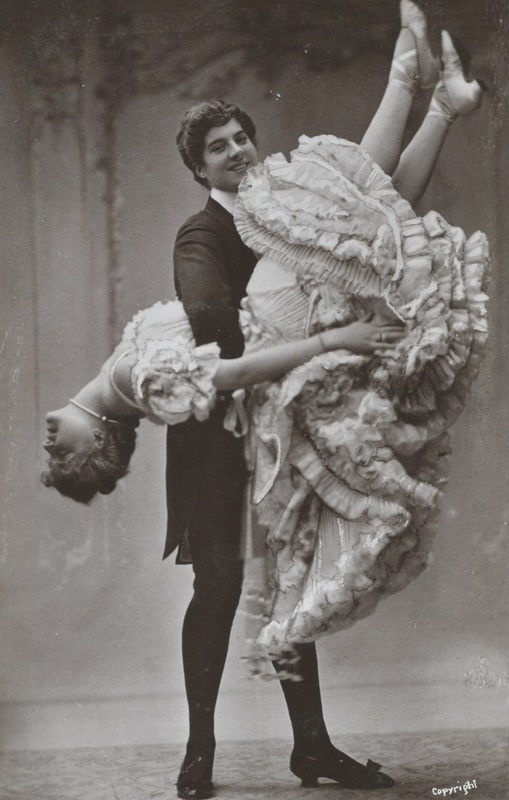 Had a postcard from Holmes and one from Quigley...’ This sounds like music hall or theatre performances. Was Vesta Tilley involved? Was the postcard from Sherlock Holmes? The realms of fantasy are endless. Whatever the answers, it’s a wonderful photo. Then, as now, there were avid collectors of postcards but no short-cuts to finding that elusive special card. Nelly writes in 1906 apologising to her aunt, Mrs Thoruley in Bolton, as she can’t get the Vesta Tilley card she wants but instead sends one of Vesta with a cigar in the uniform of a soldier. 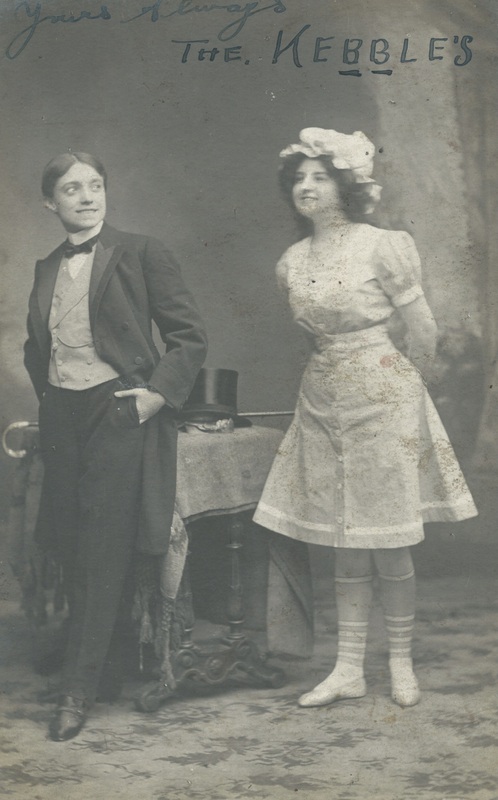 Annie sends a card from West Hartlepool to Miss Turner to say it is the only one she can get of Vesta Tilley, this time holding a cigarette dressed as a young man about town. In 1905 Charlie is pleased to be able to send a card of Vesta at all as he has had to try several shops before being able to get it. 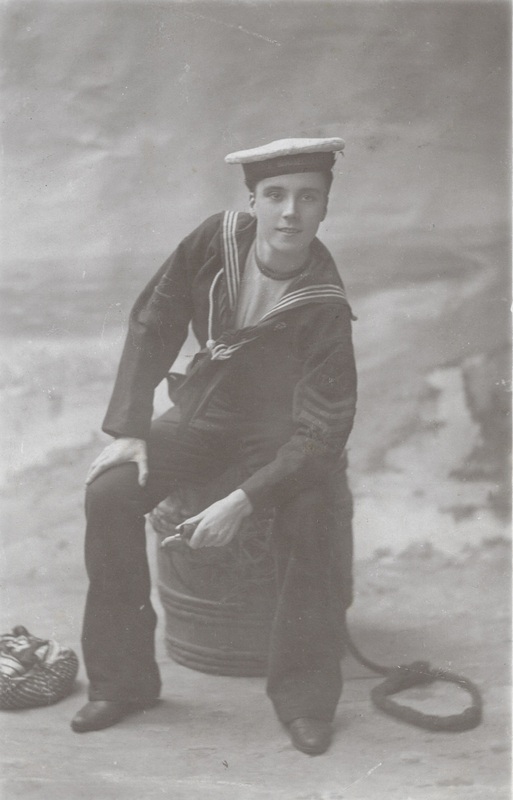 According to Norah in 1906 Hetty King has rather a nice face and Miss Greenhalgh of Southport receives a card from GS which says, ‘I believe you like sailors?’ This is written on the back of a card showing Hetty as a pipe-smoking sailor. The card writers often apologise for their poor writing, explaining it is a ‘wretched pen‘ or they are writing while standing-up. Experience of trying to decipher these messages has taught me that handwriting was as varied then as it is now and was by no means an art form which has now been lost. I have a few cards sent to Seddon Cox Esq from Babs which are in mirror writing. 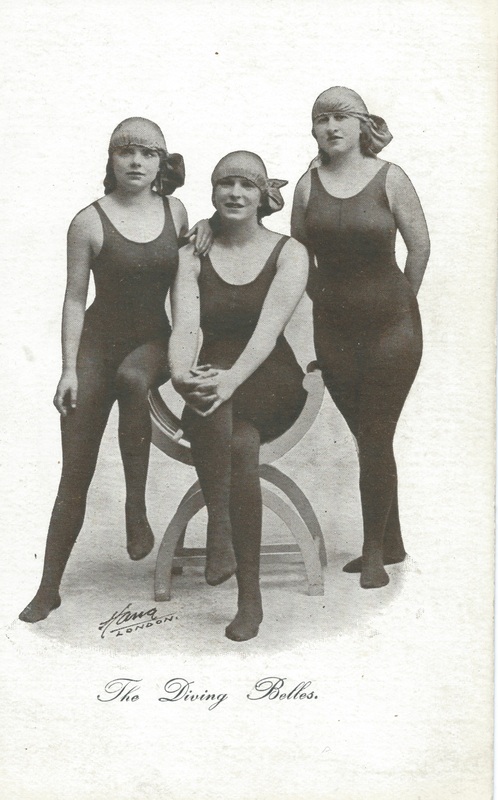 They all feature Gabrielle Ray and Miss Craske and Babs remarks on the sauciness of the card shown here. I’ve included the back of the card as well for translation by the keener among you. Click on it and you should get an enlarged picture. 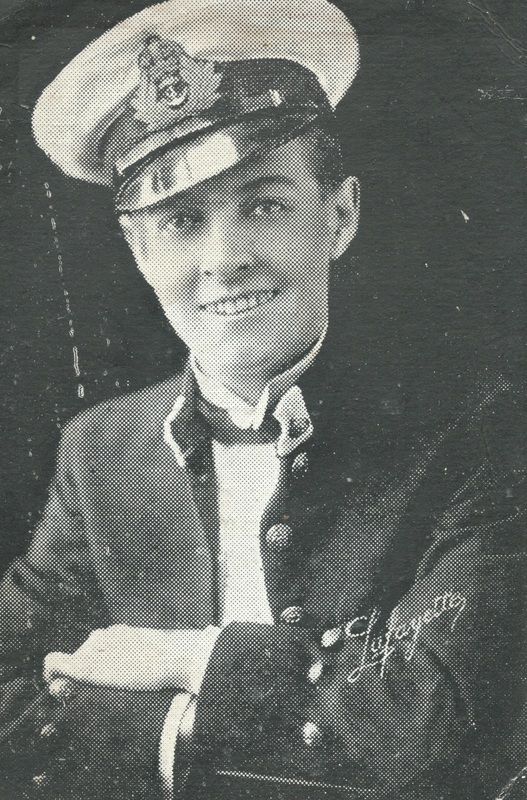 Performers used their own publicity postcards to communicate with boarding-houses and arrange meetings up and down the country. 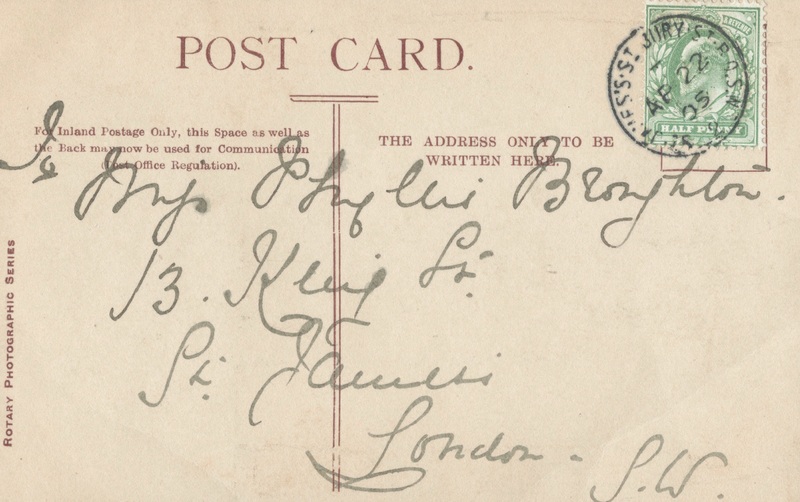 The Kebbles sent a card from Southport to Edward Stream telling him they will travel overnight to Edinburgh and asking him to call on them at their lodgings at Mrs Shaw’s. 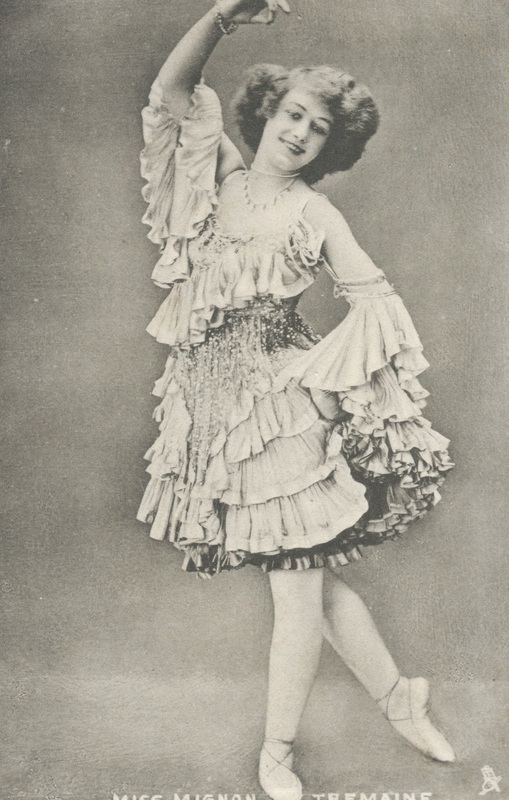 Last, but not least, is Phyllis Broughton who was a Gaiety Girl and appeared on the theatre and music hall stage. She addressed and stamped cards of performers to herself and asked them to sign and return them. 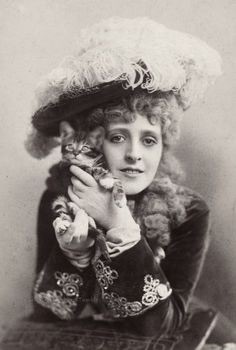 I have a Vesta Tilley card and one of Sybil Arundale, an actress and star of pantomime and musicals, with Phyllis’s address on the back. 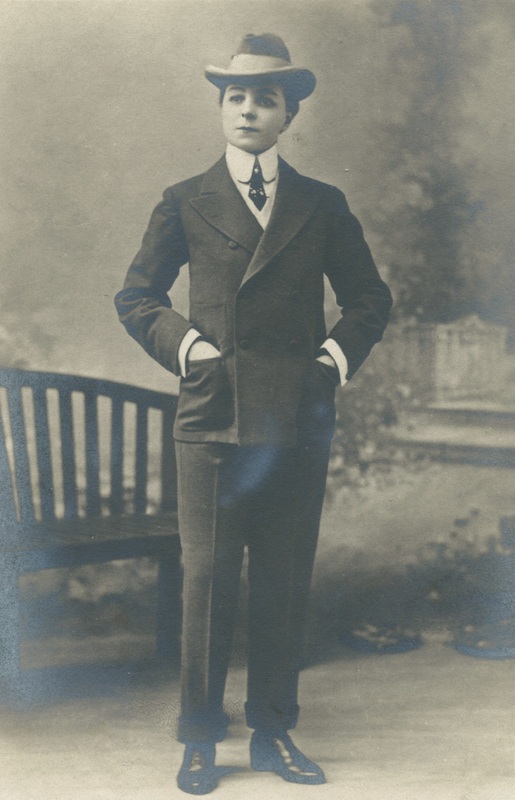 Phyllis Broughton was at one time engaged to a colliery owner, John Hedley, but sent him a telegram to break off the engagement when she received a marriage proposal from the heir to Earl Cowley. The heir subsequently jilted her so she sued him for breach of promise, winning the case and a substantial sum of money. John Hedley had built a house for Phyllis and he kept this empty but in good repair as a shrine to her. It is said he sent her a basket of fruit and flowers from the garden every week. When he died he left most of his estate to Phyllis but she had pre-deceased him. The house became a home for distressed actors and actresses. This entry was posted in Uncategorized and tagged Effie Fellows, Hettie King, Hetty King, male impersonator, Phyllis Broughton, The Kebbles, Vesta Tilley on August 7, 2015 by Monomania.